Ready Hindi Movie (2011) starring Salman Khan and Asin and directed by Anees Bazmee Rajendra was one of the biggest hits of 2011. The slapstick comedy from the comedy king Anees Bazmee entertained millions around the world and was a complete paisa-vasool movie of 2011. Ready Hindi Movie (2011) starring Salman Khan and Asin and directed by Anees Bazmee Rajendra was one of the biggest hits of 2011. The slapstick comedy from the comedy king Anees Bazmee entertained millions around the world and was a complete paisa-vasool movie of 2011. While Ready Hindi movie is a remake of the Telugu hit Ready, it nonetheless changes quite a few elements to suit the Hindi audience. If you have seen any of the South remakes (Telugu, Tamil or Kannada), you should still watch Ready Hindi movie for Salman and his “antics”. The music by Pritam complements the look and feel of the movie and logic is definitely defied time and again in movies as is expected from comedy Hindi movies these days. That being said, this is not a serious film and doesn’t want to be a serious film even in a single scene. It packs everything imaginable into it – action, romance, comedy and sentiments and there is the customary Salman-khan-takes-the-0shirt-off scene that has become a trademark since the 1990s. 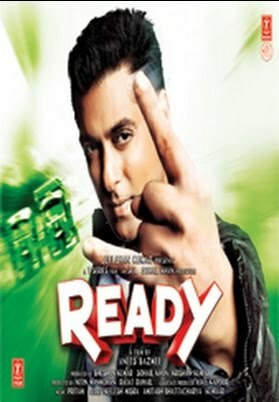 The story of Ready Hindi movie is all about Salman. Prem (Salman Khan) helps his friends get married and helps a good friend of his (Zarine Khan) to get married secretly. Mneawhile, Sanjana (Asin) comes to know of her uncles’ plans to get her married to her cousin and she elopes from the marriage hall. She finds Prem and pretends to pose as his fiance and is introduced to Prem’s family. Sanjana’s uncles – Amar and Suraj Choudhary try to search for her because she heir to a large fortune. The uncle’s goons constantly find Prem and Sanjana and are outwitted by him. Prem and Sanjana fall in love and how they dodge Sanjana’s uncles forms the crux of the story. Character Dheela Hai (Neeraj Sridhar, Amrita Kak) – This opening song is a must watch; very well choreographed and has that spunky feel to it.